Drupal is an open-source Content Management System (CMS) that allows you to build powerful websites and online applications. Web Hosting Hub offers 1-click Drupal installs, ensuring an easy and worry-free installation in minutes. Drupal is a flexible module based framework allowing web designers and developers to easily build sites for their clients. What can I build with Drupal? Replace the copy with "Almost anything you can think of. Drupal does require some initial learning to master it. But the upside is that it is flexible enough to build any kind of website or application. Drupal Distributions include Drupal Core and additional software like themes, modules, libraries and installation profiles. With a full-featured Drupal distribution you can easily set up custom websites for e-commerce sites, online communities, academic sites, business etc. All you need to do is choose the distribution, install on the web server and configure it. Drupal's active developer community ensures that you have hundreds of free themes to choose from. Modules are small programs that add a specific feature or extend the functionality of Drupal. Some examples include: inserting full-featured YouTube videos into your Drupal post, integrating Twitter into your blog, optimizing your blog for search engines, enhanced SPAM blocking, and much more! 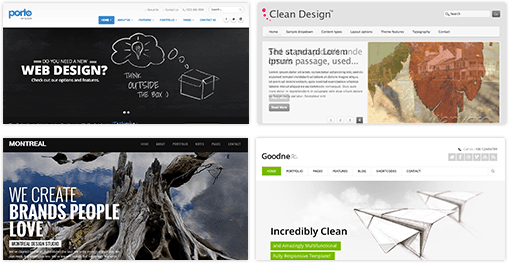 Themes are templates, and will provide your Drupal site with a certain look based on color and layout. The latest themes will include the latest design standards that will allow your site to look good on any device and load fast when it comes to the amount of code invovled. Web Hosting Hub's servers are optimally configured to run WordPress. Our servers run suPHP, which allows for a much higher level of security. Our servers also run the latest versions of MySQL 5 & PHP 5. We configure our servers to utilize PHP Caching and we maximize available server RAM, reducing I/O requests to the server's hard drives, meaning your WordPress site loads faster! We're present at Drupal events like DrupalCon and DrupalDay, which are attended by people ranging from newbies to professional Drupal developers and consultants. Transferring your Drupal blog is a snap with Web Hosting Hub. Simply back up your Drupal database, themes and plugins. Once you've installed Drupal through Web Hosting Hub, just import your database, upload your themes and plugins and go live! Web Hosting Hub is a leader in Drupal hosting, We currently host thousands of Drupal-based sites and blogs. Our support technicians are expertly trained and part of the Drupal community. Get a free custom domain to match your fabulous business or idea. You can also transfer an existing domain for free. Solid-state drives are up to 20 times faster than traditional hard drives, have faster read/write speeds and improved uptime. This means faster delivery of your content. Some hosting providers charge extra for this feature, while HUB provides it at no cost. A simple to enable, private SSL is available to you for FREE. This shows the lock icon in your visitor's browser, showing them your website is safe and secure, and can also help increase your website's ranking on Google. Third party SSLs and other SSL types are also supported. Websites are several webpages integrated together under a unique domain name. Performance is the overall measure of how powerful or capable a plan is. Click 2X or 4X to find out more. Web Hosting Hub offers unlimited disk space, which eliminates the worry of running out and let's you focus back on your life, instead of technical problems. All of our plans also offers unlimited bandwidth so that your site can be served smoothly to all your visitors. See Terms of Service for full details. Every website needs a matching email. Spark, Nitro, and Dynamo all include unlimited email accounts. Our web hosting comes standard with unlimited disk space and unlimited bandwidth. Use ad networks like Bing Ads to drive quality traffic to your website and grow your business. This allows you to have multiple domain names point to the same account - often used to send mydomain.com, mydomain.net, and mydomain.org to the same site. A canonical or sub domain name looks like canonical.domain.com. The standard ones are www.domain.com and domain.com. Depending on your shared hosting package, other names like info.domain.com or support.domain.com can be used - the "canonical" is chosen by you. Backups are essential to any website owner. We always recommend you make your own backups frequently with our simple to use backup tool. It requires only a couple of clicks. But we also offer to create a complete backup of your cPanel account for you every 24 hours for a minimal cost. Are you worried about migrating your existing website? Don’t be! We offer FREE cPanel and website transfers with zero downtime to make sure your data gets moved quickly and safely. * Applies to a cPanel account within 5GB or 3 or fewer databases and/or websites. Larger transfer requests can result in a fee of $10 per additional item to be transferred. Your secure POP3/IMAP email is conveniently available anywhere on any device. Simply choose to auto-install WordPress during the checkout process and we'll pre-install it for you for FREE on your hosting plan. Simply choose to auto-install PrestaShop during the checkout process and we'll pre-install it for you for FREE on your hosting plan. Want to build a site today but just don't know how? Well with us it's easy. We offer 400+, FREE applications that can be installed and set up with a just a click of a button. No more stress, just a 1-click setup. Softaculous gives you access to more than 400+ FREE tools at like WordPress, Joomla!, Drupal and PrestaShop with a single click. SSH access allows for a user to access their server using command line. It allows for an easier workflow and faster management than a graphical user interface is able to provide. Normally hosting companies use a single data center. This means your website and email could be 3,000 miles or more away from you. It is cheaper for them, but just doesn't make sense for you. With Web Hosting Hub you can pick from one of our two data center locations located on the east and west coast. Proximity of your business/website to your data center means your email and website can be delivered faster. Engage your potential customers with a modern website from Web Hosting Hub. We provide high-quality web design services in a wide range of customizable packages. Whether you own a small to medium business or you desire a robust e-Commerce storefront, Web Hosting Hub can get your website online in no time. We walk you through setting up your account in a personal on-boarding call after purchase. If you want to cancel for any reason, we have a no questions asked 90-day FULL money-back guarantee. All of our web hosting plans come with a 100% 90 Day FULL Money Back Guarantee. That means you can try us out for 90 days, and if you're not completely satisfied, just ask for a refund. No questions asked.